Is religion good for children? Secular children can distinguish between magic and reality. Secular children differ in happiness, mental health, and their grasp of reality. 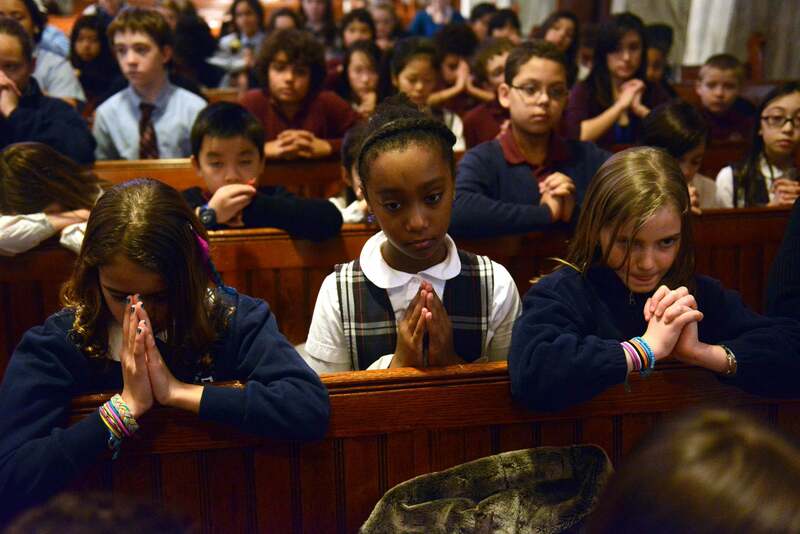 School children pray while attending noon Mass at St. Mary of the Assumption Church on March 12, 2013 in Brookline, Massachusetts. In the United States, conventional wisdom holds that you should raise your child to be religious. Taking the kids to church is the default; leaving them home requires justification. Push parents to explain why they should pass on their religion—apart from a principled urge to keep the faith—and they’re likely to tell you studies prove that kids do better with religion than without it. But is religion really good for kids? That might depend on what kind of child you want to raise. Several studies do seem to corroborate the conventional wisdom that kids raised with religion—any religion—are psychologically healthier than kids raised without it. The gap here is small but real: Some researchers link religious affiliation and regular church attendance with a mild boost in children’s mental health. That data is reported by parents, though, which presents an obvious problem: Religious parents might simply be more inclined than secular parents to view their kids through rose-colored stained glass. But teachers have also reported that kids who attend religious services have stronger self-control and react better to discipline. One reason why children in religious families might be better behaved is that they think there’s more at stake. According to the so-called sanctification theory, religion imbues familial relationships with sacred significance, and religious institutions attach moral meaning to certain behaviors. Religious parents might see childrearing as sacred work and strive to raise kids with self-control and manners. Religious kids might also see good behavior as a moral imperative and strive to maintain discipline, not just for their own sake, but to please their parents—and God. But the question of causality claws at researchers’ confidence in these findings and theories. John Bartkowksi, a professor of sociology at University of Texas at San Antonio, wonders whether church attendance really leads to good behavior—or whether it might be the other way around. “It may be that kids who are already well-behaved are the only ones who can get into religious communities,” Bartkowski told me. “Their parents might feel they’ll fit in because they’re compliant and able to sit still.” Self-control, in other words, might lead to church service, and not vice versa. One other related possibility of many is that religious parents may have more respect for authority, and they may reinforce obedience in their children more than secular parents do. Based on this research, you might think that raising religious children is neutral at worst, preferable at best, and probably worth the hassle of dragging the kids out of bed every Sunday. But there are some major pitfalls on the parental road to Damascus. Parents who argue over religion can actually make their children less happy and more disobedient—so make sure you and your spouse have settled the great transubstantiation vs. consubstantiation debate before taking your kid to Mass. Fundamentalist and conservative religions, moreover, run the risk of teaching kids who violate dogma to hate themselves. If you tell your gay child he’s “intrinsically disordered” because of his identity, or exorcise him of the “demon of homosexuality,” his mental health is likely to be quite low. Aside from these obvious drawbacks, there’s another, subtler problem with raising religious children: All that talk of snake-inspired subterfuge, planet-cleansing floods, and apocalyptic horsemen might hamper kids’ ability to differentiate between fantasy and reality—or even to think critically. That’s the implication of two recent studies published in Cognitive Science in which researchers attempted to gauge perceptions of reality in religious and secular children. (The religious children were all from Christian families, from a variety of denominations.) In one study, the researchers read realistic stories and fantasy tales to the kids. Some of the fantasy tales featured familiar biblical events—like the parting of the Red Sea—but with non-biblical characters. (In the retelling of the Red Sea story, Moses was called John.) Others featured non-biblical but clearly magical events—the parting of a mountain, for instance—as well as non-biblical characters. In another study, the researchers read children three different versions of the same story. One version had a biblical character performing a miracle, like Jonah escaping a whale’s stomach, and noted that God was behind the miracle. A second version told of the same miraculous event, but left out any mention of God. A third retold the story realistically, with no miracles and no God. Every child believed that the protagonist of the realistic stories was a real person. But when asked about the stories featuring biblically inspired or non-biblical but magical events, the children disagreed. Children raised with religion thought the protagonists of the miraculous stories were real people, and they seemed to interpret the narratives—both biblical and magical—as true accounts. Secular children, on the other hand, were quick to perceive that these stories were fictitious, construing them as fairy tales rather than real-life narratives. They had a far keener sense of reality than religious children, who failed to understand that magic does not exist and believed that stories describing magical details such as “invisible sails” could be real. Secular kids generally understood that any story featuring magic could not take place in the world they inhabit. If you’re surprised by these findings, you probably haven’t attended a church service lately. Religions tend to be founded on miracle stories—exactly the thing religious kids had trouble distinguishing from reality. When you’ve been told that a woman was created from a man’s rib, or that a man reawakened three days postmortem little worse for wear, your grasp on reality is bound to take a hit. Religious children are told these stories from an early age, often as though they are unquestionably true. (Some are told that questioning them might lead to eternal damnation.) If you’re expected to believe two of every animal could fit on an ark made of gopher wood, wouldn’t you have trouble understanding that magical sails don’t exist? It’s still unclear, of course, exactly how seriously religion hinders kids’ perceptions of reality; the children in the latest study were 3 to 6 years old, so the effect could fade as kids garner more complex critical thinking skills. And some researchers aren’t so sure the study’s results can be extrapolated. Paul Bloom, a professor of psychology at Yale, called it “a cool study by a sharp research team,” but note that most kids, religious or secular, are pretty good at distinguishing fantasy from reality. “For the most part, children only look incompetent when dealing with the stories of clever psychologists,” Bloom told me. He also noted that children are frequently exposed to seemingly incredible things that also happen to be true, such as evolution and plate tectonics, which can force them to re-evaluate their perceptions of reality. That’s the problem that undergirds pretty much every study about religion and happiness: Even if religion can make you happy, that happiness often requires us to buy into fantasies. It’s no coincidence that the most statistically significant mental health difference between religious and secular children arises between the age of 12 and 15, when nondevout kids go through the existential crises of adolescence while religious kids can dig deeper into their trench of piousness. This mental health bump disappears in adulthood, when religious people—perhaps because they’re operating in the real world—aren’t measurably happier or nicer than their secular brethren (unless they live in a country that favors believers and ostracizes atheists). The question of children and religion, then, is really just a small part of the broader dilemma of faith versus skepticism. In the United States, the vast majority of us choose the former and push our kids to do the same. That might make them docile, obliging, and credulous. But it doesn’t make them better people.